Pope Francis today surprised participants in a spiritual retreat held for civil and religious leaders from South Sudan, dropping to his knees to kiss the feet of government leaders who are working on a peace accord. 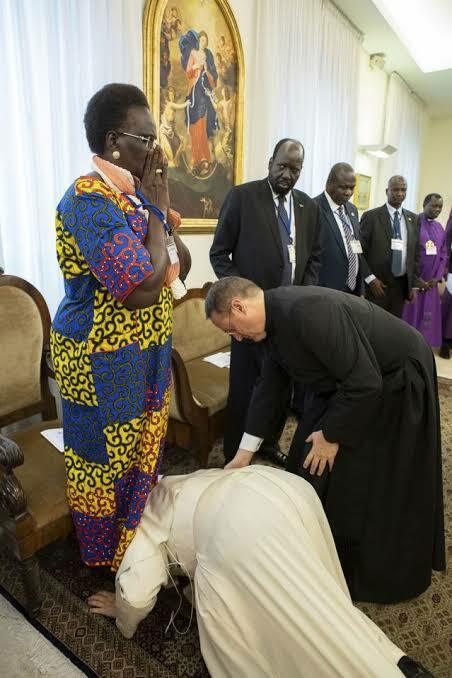 Pope kisses feet of South Sudan's leaders to encourage peace. Present at the Pope’s residence for the retreat were Salva Kiir Mayardit, President of the Republic, as well as five designated Vice Presidents, including Riek Machar Teny Dhurgon, who has been the main opposition leader, and others. Under the “Revitalized Agreement on the Resolution of Conflict in South Sudan,” those leaders will take May 12, sharing power and ending the armed conflict between clans and among communities. Justin Welby, the Archbishop of Canterbury, head of the worldwide Anglican Communion, joined Pope Francis in the retreat in the Domus Sanctae Marthae, April 10 and 11. “I ask you as a brother,” Pope Francis said to the country’s leaders, as an assistant interpreted into English, “stay in peace. I’m asking you with my heart: let us go forward, go ahead and resolve the problems. You have begun a process. May it end well. There will be struggles, disagreements, amongst you But let this be in the community, inside the office. In front of the people, hold hands, united, so as simple citizens you will become fathers of the nation. If you ask me to ask with my heart, with my deepest sentiments.” At that point, apparently to everyone’s surprise, the Pontiff walked across the small sitting room to where the leaders were standing and dropped to his knees. Cardinal Pietro Parolin, Vatican secretary of state, told ZENIT news agency that the Vatican has “cautious optimism” for a papal visit to South Sudan.